Pork tenderloin is terrific for large dinners and even better for cold leftovers. This recipe is really easy and requires minimal effort for maximum return! One of the best tips about meals like this is to reserve a little of the sauce or liquid you’re cooking with and add it to your potatoes or rice. It spreads the flavors around the plate and adds a little deliciousness to your side dishes. 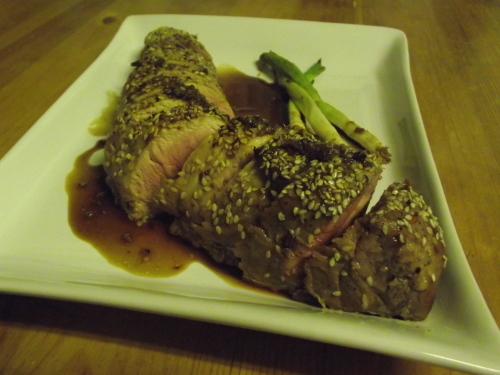 This pork tenderloin recipe can be doubled or tripled for larger groups. Mix soya, garlic, honey, ginger and chilies and coat tenderloin and then pour remaining liquid in the baking dish. Sprinkle on a pinch of Chinese 5 spice and then cover pork with sesame seeds and throw in the green onions (whole) Bake covered at 400 for 25 minutes and then uncovered for final 10 minutes. This cooks the tenderloin a nice medium-rare. If you like it a little less pink, increase the covered baking time by 5-10 minutes.